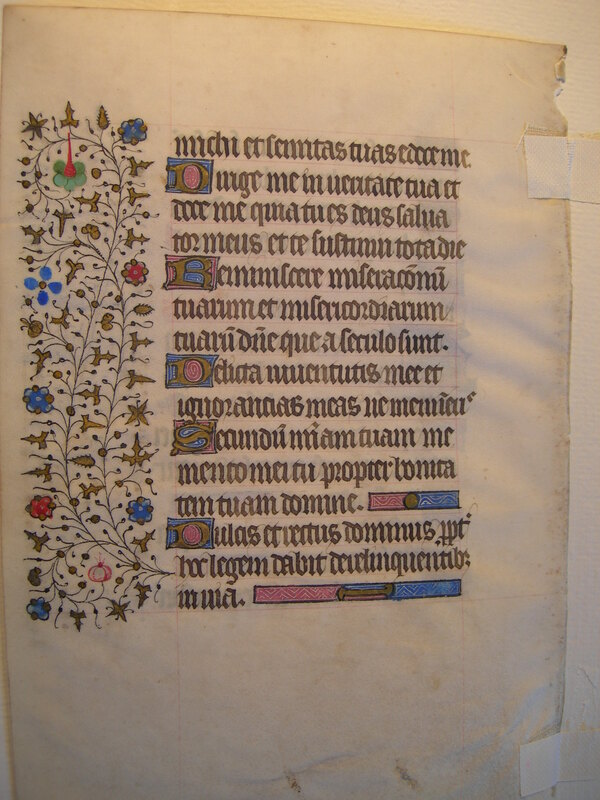 Text: This leaf contains text from the Office for the Dead at Matins, the Second Nocturne. Et misericordia tua subsequetur me: omnibus diebus vitae meae. 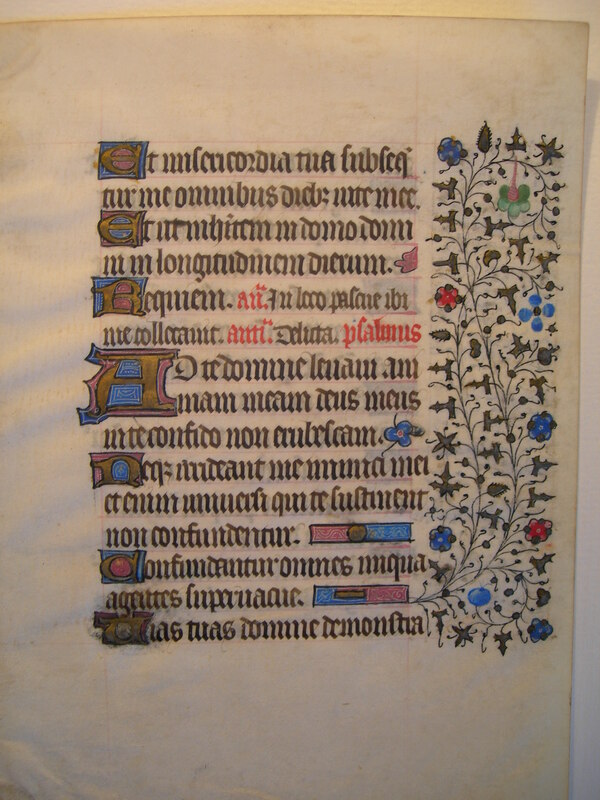 Et ut inhabitem in domo Domini: in longitudinem dierum. Requiem. Ant: In loco pascuae ibi me collocavit. Anti: Delicta. Psalmus. Ad te Domine levavi animam meam: Deus meus in te confido, non erubescam. Neque irrideant me inimici mei: etenim universi qui sustinent te, non confundentur. Confundantur omnes iniqua agentes: supervacue. And thy mercy shall follow me: all the days of my life. And that I may dwell in the house of our Lord for length of days. Eternal rest. Ant: In place of pasture there hath he placed me. Ant: The offences. Psalm. mihi: et semitas tuas edoce me. Dirige me in veritate tua, et doce me: quia tu es Deus salvator meus, et te sustinui tota die. Reminiscere miserationum tuarum, Domine: et misericordiarum tuarum, quae a saeculo sunt. Delicta iuventutis meae: et ignorantias meas ne memineris. Secundum misericordiam tuam memento mei tu: propter bonitatem tuam Domine. Dulcis, et rectus Dominus: propter hoc legem dabit delinquentibus in via. [continues Psalms 24] ...me thy ways: and teach me thy paths. Direct me in thy truth, and teach me: because thou art God my saviour, and thee have I expected all the day. Remember O Lord thy tender mercies: and thy pities, that are from the beginning of the world. The sins of my youth: and my ignorance do not remember. According to thy mercy remember thou me: for thy goodness O Lord. Our Lord is sweet, and righteous: for this cause he will give a law to them that sin in the way.